MAJOR EDIT: AUDITIONS ARE NOW CLOSED A DAY EARLY SINCE I MADE UP MY MIND FOR CASTING. THOSE WHO DID MAY RECEIVE A PRIVATE MESSAGE INVITE OVER TO MY SERVER WHERE I COULD HOST THE DUB. THANK YOU FOR PARTICIPATING. 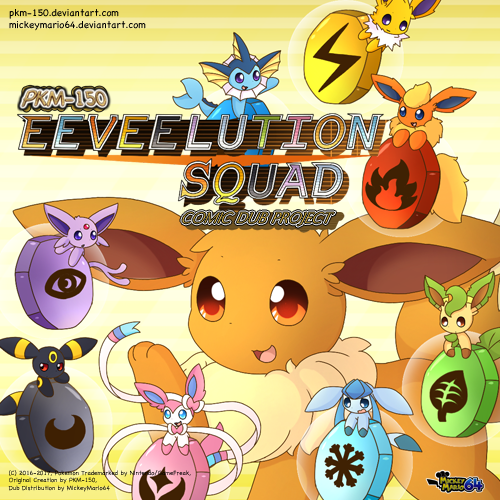 Okay, so I've been planning on working on a dub with permission from PKM-150's series Eeveelution Squad, and I want to look for voices to help bring these characters to life. And before you say it, yes, I'm aware there are other dubs lurking around the interwebs but this is a bit more official, plus it involves other people participating for this project. But firstly, I recommend you read the original comic first that way you could understand how the context goes and know how the character should act. 6. Optional: Hope you have a singing voice at least. 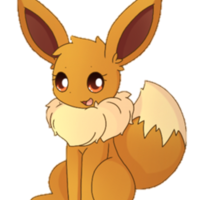 Just an ordinary Eevee. She always gets along with the others. She's often shy at first whenever she meets new Pokémon. She loves to play and have fun. Recommended Tone: Sound cheery, be happy, like a young jolly child, and also add a little tone of cute in there. Like you just wanna hug the wittle thing. I want to play with you, daddy! He was once a Pokémon Champion and a leader of a rescuer team called "Yellow Thunder" but currently, he's a gardener instead. He was known as "The Yellow Flash" because of his speed. 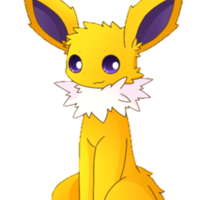 He was also known as Yellow the Jolteon due to the fact he used that name to enter the tournament. He got his current look after Flareon(Flare) accidentally burnt him (aka Flamethrower). Recommend Tone: Uhh... think of being like a father or a brother, has concern for his friends and family, even though he gets hurt most of the time. Well, I thought I would take Flareon for a walk since he really loves it. Then look who's the one walking here? You're just sitting on the top of me. Careful! You almost dropped Flareon! Good thing I caught him in time! She's a joyful and playful Pokémon. She loves making pranks and jokes on her brothers, especially Jolteon(Speed). After of that, she often gets grounded by him. 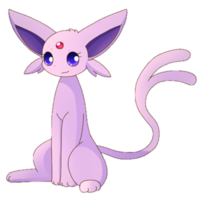 After she and her siblings moved to live with Espeon(Pearl), she became close friend with Sylveon(Silvia). Recommended Tone: Like for Sunshine, sound cheery and playful, curious and happy. Why are we in the forest again? But I'm tired to walk! Doesn't matter. I'll check it out! He's usually shy and quiet. Ever since he was little, he always wanted to become a Leafeon. He loves planting. It doesn't stop him from doing it even if he evolved into Flareon. He has a very good relationship with Leafeon(Leaf) after he met her. Big bro, are you okay? Your face is red. You must be thinking about big bro, right? Yep. I'm sure big bro will love it. Recommended Tone: Kind of a motherly figure, but if someone tries to take someone you love, show em who's boss! He doesn't talk much and doesn't like to get in trouble. He can get annoyed easily. He never mentioned to anyone about his family. Recommended Tone: Pessimisstic, emo, kind of a little raspy and deep with a hint of sarcasm. You know, dark stuff. This is the one role where you are welcome to sound depressing yet still make sure you act and not sound so disinterested and tired. The whole time you didn't see me, really? We can still have a sleepover. Just don't mix genders. She's kind and friendly. She loves her sister very much. 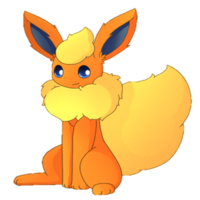 After she moved to live with Espeon(Pearl), she started to spend most of her times with Flareon (Flare). She and Flareon(Flare) works on a garden behind the treehouse. From all the times she spends with Flareon(Flare) makes she like him more and more everyday. Recommended Tone: Sound welcoming and cheery, optimistic and such, but also a motherly figure, concerned when something's wrong. Hi! You must be Jolteon. I'm Leafeon. Nice to meet you. It's funny. You kinda remind me of my sister a little. Sis, why are you always like this? She was kind and joyful. 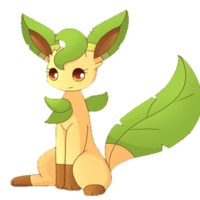 After her dad abandoned her and her sister, Leafeon(Leaf), she started to become more aggressive towards others beside her sister. She rarely shows her soft side to anyone else beside her sister. Recommended Tone: Add a hint of sass and a little bit of passive-agressiveness in there, but means well. I did tell you to move, didn't I? Fainted? You must be really weak. She's cheerful and loves to have fun. 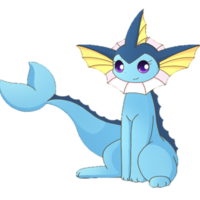 After she started to live with the others, she became close friend to Vaporeon(Crystal). 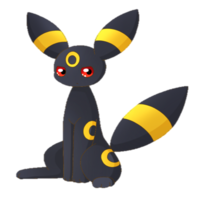 She usually spends her times with Umbreon(Black), Vaporeon(Crystal) and Eevee(Sunshine). 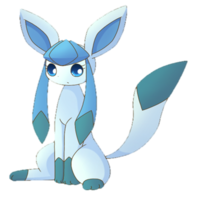 She also has childhood Legendary Pokemon friend, Manaphy which she nicknamed Mana. After she moved with Espeon(Pearl), she only visits her once a week instead of everyday. Recommend Tone: As said many times, sound cheery and jolly, with a little cute. Hi! 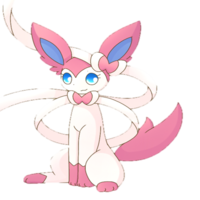 I'm Sylveon! Nice to meet you! Let's be friends!